Intacs | John Frangie, M.D. The procedure involves creating two arc-shaped channels inside the peripheral corneal tissue and inserting plastic ring segments within these channels. 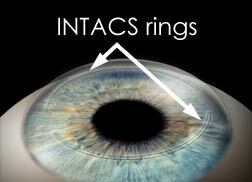 The Intacs corneal implants flatten the curvature of the cornea to reduce or eliminate nearsightedness and astigmatism. The procedure received U.S. Food and Drug Administration (FDA) approval in April 1999. The channels to accommodate the Intacs implants can be created with a special arc-shaped bladed instrument or with a femtosecond laser (the same laser that’s used to create a corneal flap for LASIK). The segments are made of the same material that’s been implanted in human eyes after cataract surgery for nearly 50 years, called PMMA (polymethylmethacrylate). One advantage of Intacs is that they can be removed or replaced with a different-sized implant if vision is not as clear as desired. And since no tissue is removed from the central part of the cornea, it retains a more natural shape. The more natural corneal shape may also provide sharper vision than LASIK. Intacs corneal implants are also used to improve the vision of people who have an eye disease called keratoconus. In keratoconus, the corneal surface becomes irregular in shape and vision cannot be corrected with eyeglasses. Though gas permeable (GP) contact lenses are usually the first treatment option for keratoconus, Intacs corneal implants are becoming a viable option, especially if a person cannot wear GP contact lenses comfortably or they fail to provide acceptable vision.